At the moment that I’m writing this I have a bit of a scratchy throat. My voice has already checked out a couple of times. My nose is runny. It seems as though I’m getting a cold. Womp. Womp. 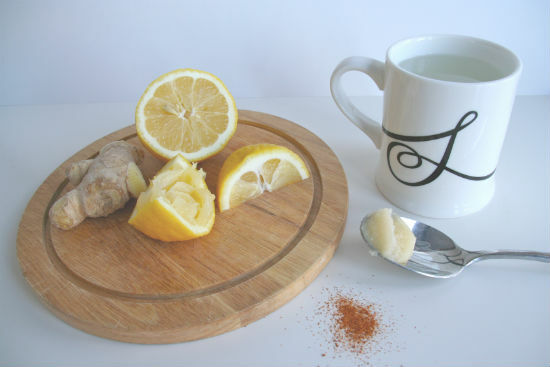 But instead of crying about it, I decided to make something for it: Lemon & Ginger Tea. The truth is that I’ve been drinking this first thing every morning for weeks. It’s super yummy. Feels good in your tummy and gets things moving if ya know what I mean. It also helps to protect against cold and flu. I’ve taken this when I’ve felt a sore throat coming on and the next day it’s gone. It’s truly a miracle maker! Ok enough of that hoolaba. 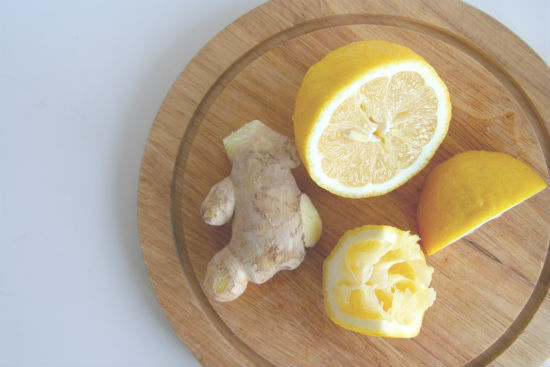 This lemon, ginger, honey drink will help you keep those nasty germs away! Pour the boiled water in the cup, but leave a bit of room at the top. I then add some room temp water. I don't know why I do this but I feel like I read something on Food Babe about the properties of lemon juice diminishing in super hot water (I could be just imagining this). 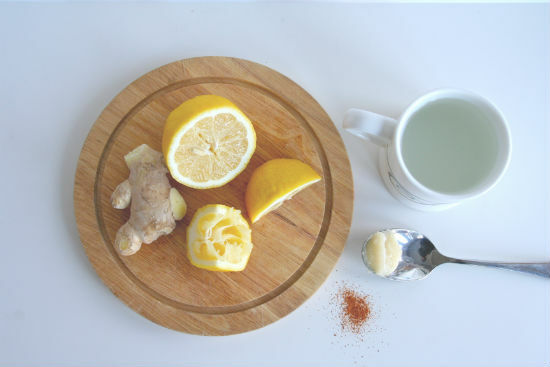 Grate some ginger into the cup with a microplane. Shake a bit of cayenne on the top. Wait! Before you go, I have a little tip about ginger and I’m going to tell you it’s life changing if you like having real ginger in the house. Did you know you could freeze it? I learned about this from an episode of Best Recipes Ever and I haven’t looked back since. You can freeze the whole thing and then just grate it when you need it and throw it back into the freezer. Amazing.